The Bangladeshi authorities will vigorously enforce a ban on begging so that it can be eliminated within five years, the government says. Their announcement follows a decision by parliament on Tuesday to grant metropolitan city status to the towns of Sylhet and Barisal. The new classification means that begging is automatically banned, as it is in Dhaka, Chittagong and Rajshahi. Critics say the ban has not worked, as many beggars still ply the streets. They have have accused the government of making meaningless and unenforceable policy statements. ActionAid Bangladesh country director Farah Kabir said that while the government's aim to eliminate begging was "laudable" it had given no indication yet as to how it would achieve this objective. "If we could remove begging from our streets obviously we would welcome it," she told the BBC, "but bearing in mind that about 40% of the people of this country are below the UN-designated poverty line it seems to be a somewhat over-ambitious target. "We don't know what will happen to people who are beggars - is the government proposing that they be removed from urban areas? "They cannot be made suddenly to become invisible, they are on the streets in most cases because there are no employment opportunities for them. They do not beg out of choice," she said. A social welfare ministry spokesman told the Associated Press news agency that detailed guidelines on how begging would be banned were expected to be in place within a month. 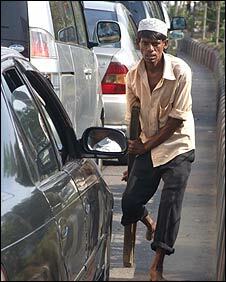 According to the proposals, anyone caught begging in public places would face a maximum three months in jail. Ms Kabir said such a measure would be a "blatant violation" of human rights. Begging is rampant in the country's two main cities - Dhaka and Chittagong - even though it is technically supposed to be banned.